The device is small and lightweight, making it easy to carry. The range is surprisingly long for a Bluetooth LE device. The design of the only button makes using it initially an act of courage, evoking concerns that you might break it. It is also only available for Android and iOS, with no Windows support. If you have Android or iOS, this might be a device to consider, but it is just one in a field of many like it. It might be worth waiting until a second generation of this model is released. There is little in the way of Design for this device. It is a simple rectangle with a translucent acrylic tip. It sports a single button that neither looks nor acts like a button. It is represented on the device by a dimple, shown in the photo. The dimple has little to no physical give, but does work on pressure. It takes a lot of pressure and a little faith when you first try it, because, in addition to there being no real feedback, the reaction of the button is heavily delayed. Even after being paired, pressing the button takes upwards of 3-5 seconds before the tone plays on the phone. In an attempt to assure myself that I was not making a mistake, I asked several colleagues, friends and family to press the button after showing them where it was. Not a single person was willing to press the dimple hard enough to activate the switch underneath. Clearly this makes both the pairing process and operation of the device trickier than it needs to be. As the voilà works off of Bluetooth low energy, it means that the device is only connected when it needs to be, and when it is within range of a Bluetooth low energy transceiver. The range is far lower than that of traditional Bluetooth, because of the lower energy availability. However, the voilà stays connected much farther than most other Bluetooth LE devices we have tried. In fact, when the device is in the middle of our offices, we can access it from almost anywhere within the offices. That has not been the case for other Bluetooth LE devices. There is really only a single control on the voilà itself - a button that neither looks nor behaves like a button. Once you get past this design flaw, the controls are fairly simple: press the button on the device and your phone makes noise. That is the extent of the controls on the device. As for the app, the process is reversed: press a button in the app and the device makes noise, assuming you are within range of the voilà. You can also locate the device using a similar process to a "Find my Phone" feature, assuming you are out of range. 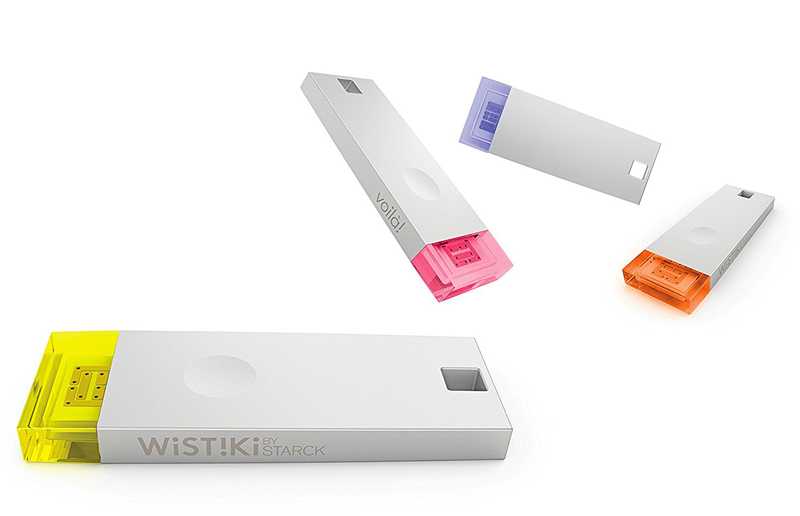 The lack of GPS in the device is compensated for because any time another Wistiki user encounters your device, it will report its location, making it easier to find. Mainly because of the poor design of the physical button on the voilà, the Learning Curve here is a bit steep. As stated in the Design section, activating this button at first requires a bit of a leap of faith. For everyone that we had try it, triggering the button was a challenge. Users had to be informed that greater pressure than would be expected was required to activate. Once aware of that nuance, operating the voilà became easier, but not exactly easy. The overall build of the device is sound. The metal body is flat and smooth in the way you would expect. There are no lumps or imperfections in any part of the body itself. The acrylic tip sits firmly on in place. The biggest issue with the build is that the seam where the acrylic and metal body meet is not level. There is a bit of a lip at the junction, part of which can be a little sharp. It's not enough to cut your finger, but it is sharp enough to scratch the inside of a pocket or handbag. The device works extremely well on both iOS and Android. The Setup process is easy and the operation is smooth. The surprising lack of usage is in Windows 10. The app is not available for Windows, either desktop or mobile. This is a disappointment both because of the general interest of Windows users for IoT devices, and the ability to port an iOS app directly to the Windows 10 platform. Hopefully in time the company will release the app for Windows as well as iOS and Android. The pairing process for this product is a little odd. It is made odder by the Design of the device itself. When adding a voilà to the app, you must press the button on the device until "a nice melody" plays. Luckily, the screen shows where the button is, because you might miss it at first glance. Once you get past the initial connection process, you assign the device a name and you are done.